Learning about Jive Hosted VoIP? "Great customer service and stable service." The Jive team is always straight forward and tries to come to a solution as quickly as possible. They also communicate openly about technical issues and send regular status updates on the progress. Any time we have questions they are willing to help and are very patient, even when we don't know the exact question that we need answered. There isn't much to dislike when their service has been so good. Any calls that have dropped have been on our customers side because they usually call from cell phones, not due to Jive's service. The mobile app can sometimes have a hiccup, but it's usually a brief moment. Also I believe it goes through wifi so that could be an issue on my end. They're very easy to work with. I didn't know how to do the setup but they walked me through it. All of the setup was done over the phone, they told me what buttons to push on the phones. Jive helped input the data needed to make the setup and integration go smoothly. Stable connections to ensure solid communication with our customers. The mobile app also allows our team members to work from home if needed. Jive is consistent, uptime and call quality are spot on! Encrypting calls...I've done this with several other vendors and seen it take days or even weeks, but with Jive (assuming you have a compatible phone), its just a click! The thing is, Jive approaches their entire platform with a level of simplicity that shows off how well their team thought out the product, as well as the things they didn't like about other products, because most of the things I don't like about other products aren't in Jive! For being such a young product, it is at a very mature stage, and I'm confident that it will only get better. Non-HIPAA compliant virtual faxing. I'm hoping that changes soon! Give it a try! You can roll it over slowly or all at once, but you won't regret it! We switched from MItel, and the difference is night and day. Conference calls are crystal clear, the UI is straightforward, user setup is simple, and the entire system is much more efficient for my team of engineers. It gives us our time back! "Great phone system...Needs wider integrations"
The phone system works--period. They gave me free Cisco 2 line phone and I was able to setup my routing plan with relative ease. Now my clients call and the get a professional phone pbx with call routing, hold music, ques, and voicemail. There phone and chat support is very good and always solved my issue. All this with a low usage line for my physical fax. I wish they had a generic integration API. They also only integrate with PAID CRM programs, not the free accounts everyone, including Zoho and Hubspot, offers. I am a single person tax office able to do a lot due to technology and it would be great to have my phone system integrate with these free limited user programs as I need to be able to take advantage of these limited user programs. It just seems they are promoting and trying to get more sales for their partners. Integrations have been the biggest issue for me as explained above. The greatest benefit is a great phone system for much less than the local phone company and other VOIP services. I love that when I call Jive, regardless of the type of inquiry, I'm talking to a person right away. They make contact by email so that you can always get in touch with the same person who you were speaking with on the phone. They make set up easy and continued monitoring or administration is a breeze! They provide lots of materials and videos for you to watch so that you can make the most of the services they offer! I love Jive. Best decision I made for my small business! I purchased a second phone in advance of when I wanted to start using it and they started billing for a second line on receipt of the phone. Do not hesitate to use Jive. Best decision I made for my small business. I can be accessible to my clients at all time - not just when I am in my office. Everything is easy to use and customer service is top notch.Jive has enabled me to make my business more mobile. "Absolutely Great Solutions for small companies"
They have a great service, for a great price and the customer service es one of the best I ever work ever. The accesability to the plataform and the interface are very frendly, easy to use and work with. I like the posibility of doing several things at the same time on the plataform becasue. Multitask is a very important part of our daily work. They are fully bilingual so that makes it easier to listen to them in my own language. Absolutely Great Solutions for small companies. In our experience we are an Outbound CallCenter and with the softphone and the jives applicaction save a lot of money, because didn´t had to buy expencive IP Phones and we get the job perfectly done. Sometimes is to much protocol to add or remove services from your PBX, especially to remove it, but they get the job done. A couple of emails will do the trick, persistence is part of our job anyway. You can reduce the process by calling their customer service phone line and request what you need to be done. I´m still getting use-to the new admin platform. Please don´t change it and I use to use the Jive´s comunications softphone, i was so much better than Jitsi or xlite. "All Inclusive and Amazing Support"
Every interaction I have had with a Jive employee has been nothing short of exceptional. We loved what we saw on initial inspection of services and pricing, and were completely sold through the experience interacting with the Sales team. It takes a while to port old numbers, through no fault of Jive. This is simply a way of life when switching providers. Make the switch! There is no reason for hesitation on this matter. Support and sales are there via phone and chat and couldn't be better. Jive enables us to continue working no matter when or where - when we choose to. Not only do our phones in the office work beautifully with a sleek interface, but the Jive app allows us to answer calls when we are out of the office, or use do not disturb so we can have time away as well. "Great performance at a great cost"
Before we switched to a VOIP phone system, I reviewed 7 other providers. I was tired of the a la cart pricing scemes, because it was going to be a pain to manage. Jive makes it to where everyone can have as little or as many features as I want them to, which makes management so much easier. Making the transition was great. You get a dedicated team that makes sure to get you answers. The system itself is so easy to use, I was able to set up most of it myself, even though the team was there to help if I needed them to. There are a couple of key features that need to be added. Right now transfer doesn't have a tone, so that's really annoying to my users. Our other phone system had an option to have calls within the system auto pickup to intercom, JIVE doesn't have this. Quite honestly my boss almost had us cancel our service due to this because it puts a lot more work back on the receptionist. Catalouge a day of phones use for receptionists, and make sure the nuances of the features are to your liking. They are young and growing but will get there now that Logmein is behind them. All three of our offices are connected. People can use their cell phone and make it look like it's coming from in the office. I can edit our portal easily without having to pay a firm thousands of dollars to do it for me. It's a vast improvement from what we had, but a little bummed about the lack of auto pickup to intercom within the system. "Easy to use VOIP service"
I think what I like best about Jive is the reliability of the product. We have been with them for over a year and they have almost had no down time and their customer service is great. We have had a few issues come up that they werent really sure of. They werent happening a lot so they kind of told me see if it happens again. It didnt but I wish they had given me a more direct answer, but I cant really expect everyone to know everything over there. If you are looking for a phone system that is easy to use and has good support. I would recommend Jive. I dont think about JIve that much which is a good thing because it works pretty seamlessly. Great onboarding and very user friendly system dashboard to be able to create, change and manage all aspects of our communications. To do call recordings, you have to connect to an Amazon AWS S3 bucket and dealing with Amazon was a painful process, so I hope they change to their own storage for call recordings. Yes, Jive has done a great job from onboarding to ongoing support. They are always accessible and provide the right solution at the right time. Then they always follow up with knowledge-based articles or they actually send me the proper steps to walk through a process. We had a traditional on premise phone switch and it was getting old as well as the expensive to support. We compared replacing the on premise with cloud phone systems and it was clear the amount of savings and flexibility would be to go with a cloud-based system. We evaluated a few Cloud phone providers and Jive was by far the winner based on price, feature set, and ease of use. One benefit beyond those listed above was that we are able to get local numbers for all our clients located throughout the US, so their clients could dial a local number and it is all easily routed to our reps - awesome simplicity! "Very satisfied after several years of quality service"
We have had a Jive hosted VoIP solution at more than 10 sites for several years. I continue to be very satisfied with the call quality as well as customer service and support. I cant really think of anything I dislike. Of course I'd love to save some $$ but when posting our RFPs, Jive is very competitive and offers a fair price. I am hopeful that the change to LogMeIn will not reduce service and support quality but only enhance it. I would definitely recommend Jive. We are very fortunate to have Kelly as our customer service rep, and I highly recommend her, but I am sure there are others at Jive who are as professional and conscientious. We had an old PBX that needed to be replaced. The Jive solution allows us to have a current solution but not pay outright for an on premise phone system. A standard monthly fee with no billing surprises is very nice. In the past we had to pay for service if any phone system problems or adds/moves/changes. Those fees were always an unknown. With Jive, all support is included, so no surprises. "Simply and Sophisticated with Superb Support"
The product is very user friendly and highly functional. But what I love most is the price and the support. It's hard to imagine all of this being possible with so little per month, and from a company with extreme credibility in this space, but that is Jive. I would like to pay less to add more people to the plan, but I know that is unrealistic. Ignore the reviews you see online. This product is great and affordable and the support team is second to none. The system is highly configurable and can handle any situation you can throw at it. What I like most is the graphical user interface that lets you route calls any way you like. By simply dragging and dropping the icons, you can make the system do anything you want in real time. Just make your changes and press save - and your system updates automatically. It runs my company when it's open and when it's closed and it keep me connected 24x7. I was able to get my company phone online in a matter of hours with little or no upfront costs or effort. Switching phone service is always difficult especially for non tech people like me. jive's customer service has been great in helping me make a difficult process as easy as possible. If you are going to make the switch from another provider utilize the Jive customer service without hesitation. It will make the move easier as the process isn't completely intuitive. The process wasn't very intuitive - It would be nice if there was a complete step by step from porting to onboarding for the non tech person in a small company like ours (or a single contact that would hand hold from port to final installation). The process seemed so daunting that at times I second guessed if this was the right decision given the addition to my workload to make the transition. We moved from DialPad to Jive. The phone quality is sooo much better. Getting GoToMeeting integrated with the service sealed the deal for us! "Great service and ease of use"
We have multiple locations through south Georgia and the Jive system allows us to route calls to specific locations based on dial plans or extension dialing. This system is easy to setup and deploy. In order for the Jive system to work properly you will need to make sure your router is on their approved router list. I was not informed of this when I first signed up and had to switch routers in 2 locations. Some Linksys models are not supported. Also, Jive is unable to port some numbers in certain areas. I had two locations that Jive could not port the phone number. I would highly recommend Jive. Ease of use, deployment, and cost effective for small to medium sized businesses. We can now route calls to different departments, such as billing, tech support, administration, etc, without having separate phone numbers and making the calls each time. We just dial an extension or for customers, transfer to that extension. I love how easy it is to make changes on the fly. When someone was sick or had unexpected weather related closures, it is easy to make those changes from home. I would definitely request a demo so you can see the product in action. I'd ask to see how the attendants work and how you make the various assignments per phone line/extension. Whenever we have needed a refresher or some help, Jive Tech Support is very helpful, even if your question is ridiculous - like unintentionally pushing the do not disturb feature and wondering why no calls were coming in. Being able to make quick changes as needed. The phone features work very well and somewhat easy - although this is a learning curve involved. Since working with Jive I have become a preferred partner and am now reselling their product as well as using it. They have features and functionality that is unsurpassed in the industry at a price-point that is affordable to all. The only thing that I have found that is less than favorable is that their only corporate directory integration is in the LDAP arena (Active Directory), most companies I work with are not at that level and therefore unable to incorporate a corporate directory presently. Seriously consider Jive. If you would like to discuss them more feel free to reach out to me. Saving money while gaining more functionality than was previously available from my other VoIP provider. Also having the ability to make changes on the fly coupled with their excellent support staff has made the transition painless. "Service at Jive is great"
I like being able to make the changes when I want to online. I also like being able to call in if I need anything 24/7. I have had questions about setup and config and they were so helpful. I have been able to customize every option I wanted. Auto attendant, hold music, closed message. My sales rep was very helpful in getting me the best deal that I could. For our size price matters and I needed to fit a budget. We were able to accomplish this with room for us to scale up. I only dislike that I have not switched all my employee's over yet. I wanted to try it out first and we are working on switching all of them over now. Use the support to help get creative on setting up what you want. They have been great in helping me. Having one number for all outgoing calls. Ease of use is huge for us. Having an auto attendant has been very helpful with our call volume. "Jive is a good solid platform." Jive's up time is great. They GUI to build phone trees is awesome and easy to use. I love the drag and drop use of setting up the automated phone tree and the ease of seeing the decision making as you are building it. Deployment is easy when you lease the phones from Jive. The phones come configured and ready to go. The system is very clunky at times. There are many times when I have made changes and they hang. I have to call support to have them pushed through. This usually occurs when pushing out a new system and making a lot of changes all at once. I have also had the issue when I am moving users between phones so they don't have to move the phone. The browser phone is hit and miss especially with headsets. I wish there was a mobile app that worked well too. Lease your phones. The system works best with the phones Jive sells. Being able to order a phone and have it be deploy ready is a huge plus. Saves time of my project team. The biggest benefit is not having to install and place a PBX on site and maintain software and hardware as is the case with a traditional PBX. Faxing also works well. It allows the individual to have a personal fax line as well as set up corporate wide faxing. "Jive - A Companies Best Friend"
I like how easily it is to forward calls online, reboot the software when needed, change lines and dial plans at the ease of my fingertips as opposed to calling someone to come in and take care of it every time. We continually have new agents coming in and out and going on vacation and do not want calls forwarded and with Jive I can easily just change it. I can also adjust the amount of rings the call receives before forwarding to a cell. I love how adjustable these features are! I dislike how if our internet starts acting up we lose the service. It annoys me when our internet goes out and nothing works and I literally have to unplug and plug back in every device to maintain operations. God forbid I am not in the office and people don't realize they are receiving calls but the calls are not coming through and we lose hours of business due to lack of communication with Jive servers after internet disconnection and reconnection without unplugging the phones. I would like a way to have the internet come back live without us having to unplug our devices. It is easy to use and quickly interchanged. Buy a quality device off the bat to save you struggles later as it is needed for the cloud based services. we are a real estate office and calls are constantly being forwarded. We also have new people coming in needing a line and an extension and its easy to add it and change it quickly on the fly. Especially being a high volume call company we need the ability to move quickly and with ease. Configurability - we have a variety of incoming phone numbers and being able to set up custom call routing based on logic that we define such as how long a call should ring here before being routed there, etc. The flexibility is great. There isn't much in the way of reporting. I can't get a report of call history on a number for the past year. I have to call in and make a request from customer service. This is a cloud service, I don't see why we can't have a robust reporting feature. We've solved the problem of balancing call loads between locations. Benefits are we have capitalized on the use of off-site call centers where the quality can be accurately measured within a pool of receptionists vs relying on a front-desk rep who has multiple responsibilities (some more important than taking phone calls). "Flexible Pricing + Powerful Features = Slam Dunk"
I love the flexible pricing structure. It's month-to-month and I can also add/subtract devices as needed. Jive doesn't lock you into a contract which is nice. Their interface is pretty intuitive, while being powerful at the same time. I also like that it integrates with Zoho, allowing click-to-dial functionality. My interactions with their support team have been good and they've always been able to help me. I wish it were easier to make warm transfers using the Jive Web interface. It doesn't connect in a 3-way conference. You can do it with the physical hardware, but most of my team uses soft phones. I also wish they had real-time reporting, instead of seeing data the day after. The last thing I wish it did was Local Presence. Definitely worth checking out. Pricing is very reasonable/flexible and the system is powerful. We launched a call center and I needed a flexible phone system that didn't lock me into an annual contract, but would allow me to grow at a natural rate. I have team members around the world and so having the soft phones was really important as well. "Jive is adequate for a small company, but won't scale well. " It is simple enough that I was able to train myself on how to use the admin portal and various functions. I don't consider myself tech savvy so that is a big positive for them. There is a big lack of reporting that as I scale my teams I will need. Agent availability, break time adherence etc... Jive is a very simple telephony solution that is good for a small company, but as we grow, I worry it won't scale well. I have also had a lot of problems with their soft phone for my employees who work from home. It is constantly going down. Jive continues to update and improve their product offering but for now it continues to be a very basic telephony option. I am used to larger enterprise solutions that have many of the bells and whistles that Jive lacks and that has been a hard adjustment. We are answering calls from customers and taking care of them. But other than that, I don't see a lot of benefits. "Great Service, Tech Support, Staff & Pricing." I like the backend management tool and the phone app the best. It helps to keep my system clean and monitored properly. I have actually not come across anything about Jive that I dislike. Jive has made a big difference on how we make a receive calls in the office. You won't find an easier solution with as good of support both with onboarding and tech support anywhere. I have solved the problem of not being able to fax of internet. I have also solved a problem where we couldn't conference call before and forwarding of calls from one desk to another. Also if I am not in the office cellphone can act as my desk phone by use of the app. "Jive Provides Great Service & Support"
Our company was using a competitor that Jive purchased. We converted to Jive in early 2017. The conversion was very smooth. The dial plan editor is fabulous and makes setting up and changing an IVR much more simple than other tools I've used. I also love the ability to add call filters so that our company spends less time dealing with trash calls. Using my cell phone as a Jive "office" phone lets me always appear to be in the office, even if I'm on the beach on vacation. That's a great feature. The continued evolution and growth of the Jive platform, as well as the outstanding support are the key reasons for my recommendation to anyone considering Jive as their phone system provider. The pricing model was different than the last vendor and was confusing at first, however the billing support team was very helpful in tweaking the plan to reduce costs. It's only possible to send a 5-page fax. I know...not many people fax anymore, but sometimes you just need to. We needed a solid VoIP platform that could be easily configured by a small office. Our company is totally decentralized so service everywhere was key. Jive provides that and excellent support. We have flexibility and power to look like a much larger company. "Great customer support, easy to use interface"
I like how easy the system is to use and how great customer support is. Some of the settings are a little hard to find. The setup for call recording is far to difficult to setup. We are not using that feature so it wasn't a problem for us, but to do a full call recording it requires an Amazon storage account. If they would implement other options such as Google Drive it would be a much better feature. Speak to customer support, the system is easy to figure out, but there are a couple of things that are not obvious. We were able to get rid of an aging phone system and migrate to a completely cloud based solution. The system is much easier to manage and setup. We can now have an automated attended and pre-recorded messages that can be activated based on schedules and other external triggers. Jive is predictable, uptime and call quality are right on target! Scrambling calls...I've done this with a few different merchants and seen it take days or even weeks, however with Jive (accepting you have a perfect telephone), its only a tick! The thing is, Jive approaches their whole stage with a dimension of effortlessness that flaunts how well their group thoroughly considered the item, just as the things they didn't care for about different items, in light of the fact that the vast majority of the things I don't care for about different items aren't in Jive! For being such a youthful item, it is at a develop organize, and I'm certain that it will just show signs of improvement. Non-HIPAA agreeable virtual faxing. I'm trusting that changes soon! If you are searching for a telephone framework that is anything but difficult to utilize and has great help. I would suggest Jive. I do consider JIve that much which is something worth being thankful for in light of the fact that it works pretty flawlessly. We changed from MItel, and the thing that matters is night and day. Telephone calls are completely clear, the UI is direct, client setup is basic, and the whole framework is substantially more proficient for my group of architects. It gives us our time back! My favorite thing about Jive is the administrative portal. I wish that is had messaging SMS that could extend to others than those in our company using our business phone number. Also, sometimes I am told the sound quality cuts out. during a call. Great system for basic needs. Ease of Administration. I love the drag and drop dial plan set up!! Well, the system is extremely cost efficient. We no longer have a need for a receptionist because of the Auto Attendant and the mobility of the system makes it great because I never miss a communication even if I am out of the office for a period of time. The voice mail to email is great too because even when we are out of the office we can easily access our voicemail. I really like it! "Jive makes working outside of the office so easy!" I love that I can work from home and still get my calls through Jive. I also like that it gives me privacy by connecting my office line to my cell phone so I don't have to provide people with my personal phone number if I'm working from home. The only issue I've noticed is that the connection isn't as strong if I'm connected through data rather than an actual wifi network. Other than that I haven't noticed any significant flaws. I really like this app! I'm so glad to have it! The biggest advantage of using Jive is that I can work from home or make calls after office hours without having to use my personal phone. It gives me the opportunity to work on my time and keep my privacy. I love that I can save money and the environment by using less gas when I work from home! If the roads are bad due to weather, Jive gives me the option to stay safe at home and work there! Half of my job involves calling parents and Bigs for match check-ins. Most of these calls happen anywhere from 5-8 PM. Jive allows me to make these calls from home, so I don't have to stay late at the office to call people when they get home from work. This also gives me the privacy I need to make calls, so I do not have to give out my personal phone number to parents and Bigs. I highly recommend Jive to anyone looking to make their jobs easier when the office is inaccessible! "Jive - Easy to Use and Easy to Implement"
Jive has an incredibly user friendly interface and has far more usable features and added value items than any other phone system we've used so far. (We've also used Ring Central and Nextiva). They are also less expensive and cost efficient than the competition. Their customer support can sometimes be lacking and also their reporting is not the most robust in the industry with a notable lack of flexibility. If robust call reporting is important this might not be the best for you but if you are looking for a cost efficient system that offers ease of use and lots of features then this is the right choice. 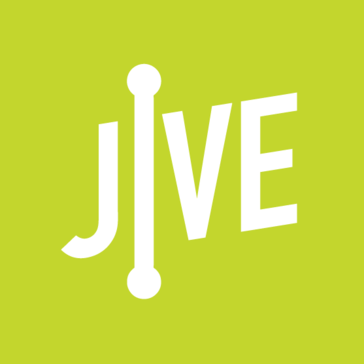 Jive has given us the ability to change our PBX quickly and nimbly without a lot of steps. Being a startup environment, Jive has given us the ability to be nimble and quick and save money as well. "Jive is very convenient but not without bugs"
I really like Jive, ease of access and very user friendly. Once you are able to navigate the admin portal is become second nature. The phone lines keep dropping. There was one day that Jive services went down for the northeast completely. We were unable to make or receive calls for about an hour. Their chrome extensions and very useful and convenient but again, they need to work out the kinks. If the extensions would work properly even 85% of the time, I would give the a 9/10. I used to be able to chat with Jive support, I can't tell you how disappointing it is that they took that feature away. Now, for even the simplest request, I have to call in, be placed on hold, open a ticket and then be transferred to a technician. That is the only reason I didn't give the quality of support 7/7. Also, I would recommend that they deliver on the Jive click to connect extension. It claims to be able to integrate with LinkedIn but that is clearly not true. Jive gives you the ability to have your desk number with you everywhere you go, even on your mobile device. Their salesforce integrations are the most useful as our sales people can have a clients salesforce record automatically open on their desktop if said client were to call their desk number. That's way better than just having caller ID. Communication, value. and flexibility have set Jive apart from other VoIP vendors. We have 32 offices throughout the US and Canada, and Jive has been an excellent platform for our unified communications. Porting from 12 different voice vendors has been exceptionally smooth and any issues we've encountered along the way have been easily dealt with. The only issue we've had with Jive has been self-inflicted, and even then Jive has been very willing to work with us. Porting one of our offices took three tries due to new ISP issues or current provider port denials. Having a single portal to manage voice configuration has been fantastic. Additionally, having a single provider to provide support when issues do crop us is fantastic, and Jive's tech support is excellent. And most importantly, we've significantly reduced the total amount we pay for voice services by converting to Jive. The communication I get from Jive and the attention they give to support issues is outstanding and seldom seen today. It is more than apparent that they care about customer retention. This is honestly the first company I have worked where the customer rep calls each month to check in with me and ensure all things are working properly. I truthfully can say I don't have anything that I honestly dislike about Jive. I would like to see a few additional features in the end user portal, but these are more focused toward my circumstances. If you go with Jive once you have been using their service for the first year ask that they assess your phone usage to see what phones get lower usage and qualify for the half price plan to reduce costs monthly. Of course they will require that you renew the yearly contract with them, but but if they can find you savings like they found for us it will be worth the renewal. Additionally, the willingness to reduce costs in order to lock you in as a customer for another year shows they want to keep your business. I have been looking for ways to cut costs this fiscal year and Jive has been my biggest cost savings of the year. We have been Jive customers for a few years now and they were able to come in and look at our usage and slash some of our services in half. There was a slight hand-off issue between sales and service dept. Took a few emails from myself to get things back on track. "Easy to use and good value VoIP provider "
Good GUI admin interface with easy to follow workflow and setup options. Support is typically pretty helpful. User web portal has yet to be updated to match admin web portal. This has caused some issues with users not being able to setup programmable buttons on their own phones which created more work for the admins. When you call tech support, you first talk with a triage support person who assigns a ticket number. Then they transfer you to the right department and you have to give that same number to the next person and explain the whole problem over again. I understand the need for a triage support person to start but the system should pass the information on to the next support analyst instead of requiring me to repeat myself. I would pick them again if I needed to pick a VoIP provider for another business. Phones used to be managed onsite which caused issues during power outages. Now using VoIP our phones fail over to cell phones in the event of internet or power outages. With Jive, we have dependable, responsive phone service. The service makes management options available that we wouldn't have even thought to ask for before we'd seen it in action. We can manage where each DID points, whether to an extension, a ring group, or a detailed dial plan. Further, the dial plans are edited in a visual flow-chart design interface, where you drag and drop nodes onto the plan and connect them to indicate where the caller should be sent next. Conditional nodes like schedules or auto-attendants give multiple options for "next node." It's intuitive and flexible. This is really reaching, but because of the flexibility that Jive offers, setting up a new line can take a little longer than normal. Each user has three separate resources: a user record, an extension record, and a device record. I have a background as a DBA, so this is fairly intuitive, as I "get" the underlying structure and how this is necessary and even helpful, but a less technical user might be a little confused. it's maybe a 2 on a 1-to-10 annoyance scale. I have zero reservations about Jive. They're marginally more expensive than some of the local fly-by-night operators, but with far less downtime, immediate support, and I can manage everything from the online control panel. I've never needed to call to make changes. 1. We are able to add fax listeners on all lines, and 2. we use the HTTP request nodes in our dial plan to alert our online CRM about incoming calls and to prepare for a recording file. This sets off a function that sorts uncategorized recordings, and matches them to a customer record. The phones work well and usage stats are easy to access. Customer service is very responsive. I can easily configure my phones any way I wish. Jive gives me mobility without the chance of missing a call. If I ever have a question, I can get my answers quickly and easily. Although implementation was a bit rocky, the Jive technician worked well with the Comcast technician in getting us up and running. Implementation training gave me the tools I needed to take full advantage of the Jive features. I also like the fact that by using Jive, we are supporting a local business. Very little. The salesman did not prepare me for everything that would be needed to get started and we are in an older building, so installation was a bit of a hassle. The sales people should be more up front about the infrastructure needed to make Jive work. The price is competitive, but as a business owner, I wouldn't mind a better price. Do it. They are great and always getting better. I am able to configure individual phones according to our needs and change configuration as our needs change. I am also able to get reporting easily and in an understandable manner to track work habits. I can track number of calls, average duration of calls, and other stats that will help me manage both my sales and customer service departments. This helps us gauge our effectiveness, set expectations, and plan for the future. It is a competitively priced service great for my small business. There are lots of options for call routing and I can work from anywhere and be connected. The only real issue I had was with my router not working perfectly with the system. Jive support was helpful and we were able to rectify the issue without a router upgrade. Jive seemed to me to have the best combo of price and features for a small business. I have not had any reason to be dis satisfied or look for another service since signing up. When faced with technical issues I did receive support from an overseas call center which made things a bit challenging from the perspective of simply understanding the tech support agent, but at the end of the day they did give me the info I needed and I was able to continue with using the service successfully. My business is only four people and we have difficulty with any new technical issues. Over all Jive was easy enough to use that we've all adopted it successfully and have not looked back since making the leao from a landline. Prior to Jive we had a landline with a central voice mail. It was outdated and unprofessional. Not only that but one of my employees was always answering the phone and acting as an operator. Now they are free to do other more productive work. "Amazing for evey type of Business"
I love how easy it is to take Jive with me. I recently lost internet in my office and instead of losing a whole of work I went home and turned the app on . I love the support and how easy it is to call and tell them what you need and they walk you through the steps without making you feel inadequate. I cant say enough good things about Jive and all that they have done for my business. I wish my clients would be able to send pictures through the text messaging. Its a great budget friendly solution. I am able to track the number of calls coming in and out of my office as well as be able to help with calls coming in even if I am running an errand. The system is very full featured and gives us lots of flexibility, without the hassle of transferring lines, etc. It is perfect for our small company and employees who often work offsite. The Tech Support team is excellent -- very knowledgeable and helpful. I've never once stumped them with my questions or concerns. Trying to make changes to the dial plan for adding a sound clip for weather closings, etc. is impossible on a mobile device -- I've tried to do it. Also, we've had to do some elaborate work arounds so that all my folks can access calls for their extension, as well as the main line when they are manning the office. Not ideal, but we've made it work. But as a result, I wind up getting notification of calls to their extensions, too. Finally, we can't do texting because our number is an 855 number. Not a major complaint, though. More flexible, was able to drop our land line, good mobile app for our work outside the office. "Great in area, not so in others, overall good service"
The configuration is clean and easy to understand, especially the call flow (IVR menu setup) with drag-n-drop, and ability to upload or record voice or MP3 (hold music) where needed. Shared voicemail, and ability to use physical phones vs just softphones. The support. With the exception of Dennis Lam, the support structure feels very distant, and at times difficult to understand. If you're looking for detailed analytics, this may not be for you. If you need to see who's on a call (that are not taking QUEUE calls) this is not for you. If you need a simple system for voicemail, faxing, multiple lines... then this is a solid product. I needed an IVR that allowed for detailed tracking of inbound and outbound calls, and to see a live 'wall board' of queues. "So much better than traditional phone software"
Sounds tacky, but the first thing that I like about Jive is the price. We're used to spending thousands each month on a traditional phone system throughout our customer services and IT departments. Jive is a fraction of that cost. Also, its pretty simple to setup. We had the previous infrastructure of our cat5 cables and phone lines throughout the office, simply getting them plugged in was all we needed. Everything else was online. The only downside is that it isn't nearly as robust as traditional phone systems. Meaning, our previous system had reporting that was automated that we could create custom for average length of calls, number of calls, outbound/inbound, and looking for infractions. Jive has online reporting, but it is a bit of a manual process. But the cost and simplicity makes up for this hands-down. I would imagine this would be more difficult to setup if we didn't already have the infrastructure from our cisco phones. I'm not sure how hard it would be, but Jive seemed ready to help setup anything we needed. so that was great. Customer service phones, technical support, and inbound/outbound calls. "Best System and Customer Service"
The technology behind the jive system is great as our business is expanding. Its very user friendly and gives me reports I can pull to check up on productivity or workflow from certain areas. The customer service is 24/7 so there is always some one there to pick up and help out. Honestly There is not much to dislike but the only thing would be that the texting feature is still a beta. First off we had land lines prior and in order to receive more phone calls and be able to have people on those lines and calling out or holding. We are able to receive multiple phone calls at one time without having to purchase multiple lines to funnel in and have a hold queue. There are many many other things that we have never had in a phone service before. Jive has all the features you can possible imagine in a business phone system. Very easy to setup and get started. I cant see using anything else. They are always improving their services and offerings. Support is easy to use, and gets it right. The only thing I dislike, is that the materials for investigating or learning about features or to do a more complex setup weren't complete or easy to find The organization of these materials is being improved all the time..
Jive is a great choice if you are looking for a quality business phone service, with call center capabilities. Not many even compare to price vs. features vs. ease of use. Implementation and utilization of a stable, scalable real business phone system has been achieved with relative little ease and little investment. We are a church who are in our first month using Jive. FIrst of all, it is less expensive than our former service. And it has many, many additional features. We particularly like being able to get voicemails at our extensions and as email attachments as well. We also love the conference call bridge, which enables callers from outside the building or those using their extensions to jump on the conference call without using an outside service. Finally, we needed a lot of hand holding as we got set up. The onboarding specialists we worked with were all patient, professional and knowledgeable as we got set up and figured out how to make the system do exactly what we wanted it to. Bravo, Jive. We have found that our Jive service is only as good as our internet signal is. Our 30/10 DSL service cuts out at times and if I am on the phone when it happens, the call can drop. We also inquired about making the rings different depending on whether the ring is from an outside call or a transferred call from within. Jive was not able to do that for us, although they did give us a good suggestion as to how to work around it. As a spiritual center providing 24/7 accessiblity using full time employees, part time employees and volunteers, it is important to have tremendous flexibility in the way we communicate. Our Jive system has helped us connect better with our community and with each other. I LOVE LOVE LOVE LOVE LOVE LOVE LOVE LOVE the Administration portal!! It was so easy to get the company up and running and clearly understand where each call is going to end up. Dial plan design is the BEST! You drag and drop your options to fit your call flow style. I was even able to route Spanish language calls to a completely different experience in English, so every caller understands clearly what to expect - and prep the representative to answer in the correct language. That is good design! Also, to be honest, cost was a major factor. Jive is HALF the cost of our current phone bill with Ring Central. That's a big deal for VOIP services, and a big win for customers! As a Medical company, we had quality issues that we could not work around because we have clinical staff who may have to guide callers towards emergency services. about 11% of our calls had static on the line, a dropped call, or volume issues for unknown reasons. At present, we've discontinued Jive and hope call quality will improve. During trial, we managed to build a solid solution to the language barriers of the patients we work with. Each patient can get the best level patient care over the phone by prepping both parties through well-designed dial plans. "Solid VOIP, great customer service"
I am new to VOIP, so needed lots of help and continue to need help learning the system and doing set up. I got and get so much help from JIVE tech support, they are great. Always happy to help, always there!! And if the person on the phone cannot immediately help me they pass the call along or do a follow up. Very impressed. The main thing that my team does not like about VOIP in general is twofold -- we cannot see that someone has picked up the phone -- we have a single number that anyone in the office can answer. And then we cannot see if someone is on the phone. With our old land line system we used 4 lines and could see when someone picked up, when someone was on the phone and what lines were in use. Other than that there is a little difference in quality. The VOIP has more hang up issues and periodic lack of service, where the AT&T lines we had before were actually fuzzier day-to-day. Overall JIVE has been great. "Great system for any office - even one with an IT department"
I was extremely skeptical about using Jive initially and looked to see if we should bring phone management in house - DON'T DO IT! No negative! Don't consider - do it! Jive takes care of all of phone needs - individual, conferencing, faxing, etc. They provide the hardware AND software - it's easy as 1,2,3. Benefit is that it is the holy grail of outsourcing - good, fast AND cheap. I can have all 3! We have spoken to many different companies and used Ring Central in the past. The cost is far cheaper than others we have inquired about or used before and we get almost all the same features (all of the ones that we use). Especially as a smaller office, we do not need all the extra features that automatically come with other company costs and JIVE allows us to use everything we need for a great deal. It sometimes takes awhile to get an answer on technicial issues but normally not longer than a day. When we were on-boarding, we were able to talk to some one right away and assumed it would always be that way. Although, it is still not a long turn around time for response. Some of their features we use such as the app is in BETA mode and has some hiccups but they have been transparent by letting us know they are working to fix them. Look at the features for what you need and use on a daily basis and compare it to the prices to see if it is a great fit for you. Personally feel it is exceptionally great for smaller offices. We use it as a phone service and like the ability to talk with patients when we are not in the office. It is very convenient for us and creates a smoother transition from our days off to our clinical days because we are only in the office 3 days a week. The reliability is pretty good. The cloud is pretty fast and responsive, unlike the previous service that used. I also like to the caller ID feature. I also like the cordless phones that I was able to be provided along with the service. The call long could be better. The ease of use for the auto-attendant could be easier to use. I still do not have it setup exactly the way I would like it to be. Organization issues with phone calls. In the past, we had issues with call history and logs. We would often miss calls due to the lagging of the system that we used. The Jive Web interface and mobile application makes the ability to work remotely very simple! In all of the interactions with the customer service and support, the Jive staff have been excellent to deal with and extremely professional. The process it takes to obtain SIP credentials for soft-phones was a little time consuming and required some extra steps that seemed unnecessary, but their support was fast in getting our SIP credentials sent to us. The mobile application doesn't appear to have any notification to warn you if the phone becomes unregistered, which would be nice. The Web Application has a little popup notifying you if the device phone becomes unregistered. Great product, their customer support has been excellent. Calling Queue Systems, Call Recording and Extensions. The Jive Admin UI is very straight forward and easy to understand. There are so many great features that we use every day with our system. As an admin my favorite features include the schedules where I can arrange special greetings for specific time periods. We have a completely different automated attendant for the holidays. Our users really like the integrated voice messaging - email and faxing so they only have one phone number to give out to their clients. The mobile app is inconsistent, but it is made up with the find me type ringing feature so it is rarely an issue for my users. The integrated conferencing has allowed us to stop using external voice conferencing services reducing costs. We also have several users that work from mobile phone only and the system allows these users to still have an extension on our PBX and automated directory. * We monitor all Jive reviews to prevent fraudulent reviews and keep review quality high. We do not post reviews by company employees or direct competitors. Validated reviews require the user to submit a screenshot of the product containing their user ID, in order to verify a user is an actual user of the product. Hi there! Are you looking to implement a solution like Jive Hosted VoIP?